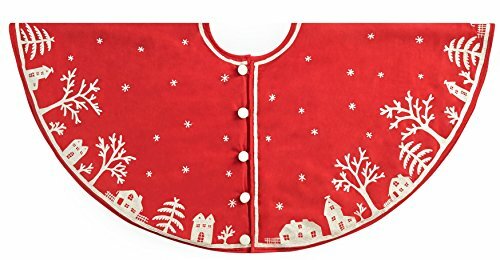 Striking tree skirt with lovingly embroidered snowy village in white silhouette against a Scarlet background. Its peaceful, cozy winter Vibes will fill the whole room. Uniquely pretty and tidy button closure. Cotton with crewel embroidery, 60". each handmade Arcadia Home design is as unique as the artisan who created it. Arcadia Home is a member of the Alliance for Artisan Enterprise. By purchasing this design, you are joining our efforts to support artisans worldwide.